"This is a great summertime drink!" 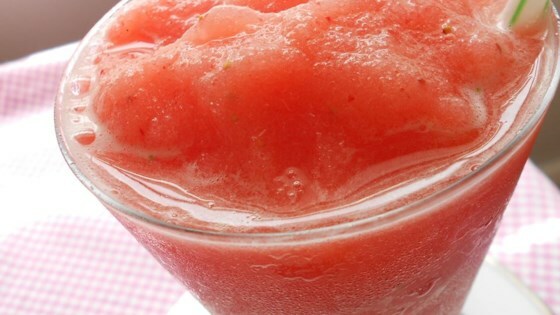 In a blender, blend the lemon juice, water, strawberries with juice, sugar, and ice cubes until slushy. Serve in a tall glass with a straw. See how to make a chilly lemon and berry slushy. Really tart. When summer rolls around I'll give it another try adding some rum into the mix. I used half lemon and half lime juice. I also used frozen strawberries so left out the ice. Refreshing drink. Perfect summer treat! I followed the recipe exactly and it was a perfect mix and lemon, strawberry and sugary sweetness.